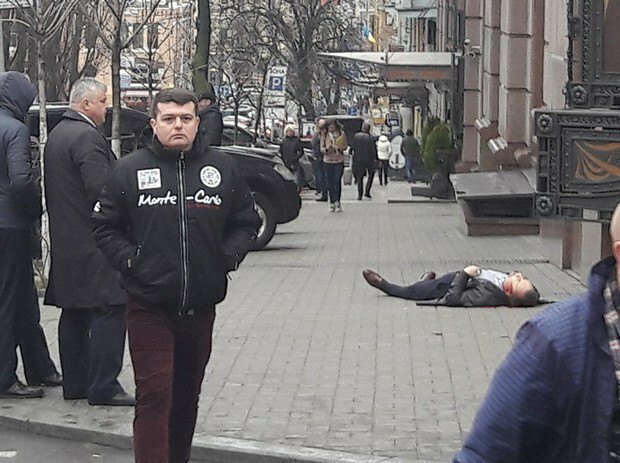 Denis Voronenkov's security guard wounded the killer. A former member of the Russian State Duma, Denis Voronenkov, was shot dead outside Premier Palace Hotel in Pushkinska St. in central Kyiv, the head of the city police department, Andriy Kryshchenko, has told 112 Ukrayina TV. "An unidentified person opened fire when Voronenkov and his security guard were leaving the hotel. As a result, Voronenkov was killed. His guard was wounded but returned fire and wounded the assailant. Police are working on the scene. The wounded men were taken to hospital," he said. The hospital where the killer was taken to is under police protection, Kryshchenko told the TV channel. Voronenkov earlier gave evidence to the Prosecutor-General's Office (PGO) of Ukraine in the case of high treason by fugitive ex-President Viktor Yanukovych. On 23 January, PGO head Yuriy Lutsenko said that his office questioned two former Russian lawmakers. One of them is Russian politician Ilya Ponomarev, who obtained Ukrainian residence permit last year. "Their testimonies indicate that the Kremlin launched the mechanism of the incursion of Russian troops into Ukraine in December 2013 when the Maidan protests in central Kyiv were peaceful. When [then Russian presidential aide Vladislav] Surkov came to Kyiv in December, a probable military invasion was on the table," Lutsenko said. A few days after that, the Russian daily Kommersant said that the second MP was Russian Communist Denis Voronenkov, who fled to Ukraine. A few weeks later, Voronenkov said that on 6 December he was granted Ukrainian citizenship since he was half-Ukrainian. Ilya Ponomarev said on Facebook that Denis Voronenkov was going to a meeting with him when he was killed.